So tonight wasn’t really about the food. Tonight was about the best pint of beer I’ve ever drunk. Tonight was about The Gunmaker’s Pub in Farringdon and its charming and interesting landlord. And also about Ascot Ale’s Anastasia’s Imperial Stout, which clocked in at an impressive 8% ABV. My word, but this was good stuff. 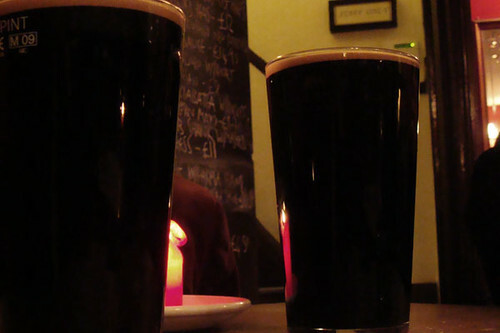 I’m not a major stout or porter drinker, i’m more of a real ale and good wine kind of guy. But this, this was fantastic – all chewy chocolate and coffee notes, with a lot of depth (think beef stew rather than any other drink) and none of the watery, light, bitter notes of your Guinness or other wimpy dark beer. This is the proper stuff, not to be taken lightly, and drunk with due care and attention to the taste. And that taste – it lasted, it had legs, it was pretty damn good beer in other words. And it has convinced me to go back to The Gunmaker’s and try more beer and their food. if they put the half the attention into their food that they put into their beers, then it’ll be pretty damn good grub. I would particularly like to try the stout with their lamb shank or steak sandwich – both of which looked like good, unfussy, well cooked pub food. Next time maybe definitely. It was a stunning beer, and very well kept. Lovely to buy it by the pint. And The Gunmakers, wow, what a pub. We must return and try some kopstoot. And eat there. Jeff has an amazing knowledge of beer and pubs, the food is excellent and you’d be hard pressed not to fine a decent ale or drink there! I can’t wait till I’m able to get over to London again. @Tom G – it was and we will! @Paul he was a gold mine of good info and really knows about beer (not to mention keeping it well). Will be sure to try the food next time. Sign up to Qype (if you are not already a member) and throw your name in the hat! Luiz – nice one thank you! I love the pub, the landlord’s very cool and Qype looks interesting so i will do exactly that.